AMARILLO, Texas — I do enjoy the spring season each year. It is especially glorious on the High Plains of Texas, which can be subject to winter brutality. Barren trees, biting cold wind, snow that traps even the sturdiest of motor vehicles. Then again, there’s the fall on the High Plains, which isn’t bad, either. 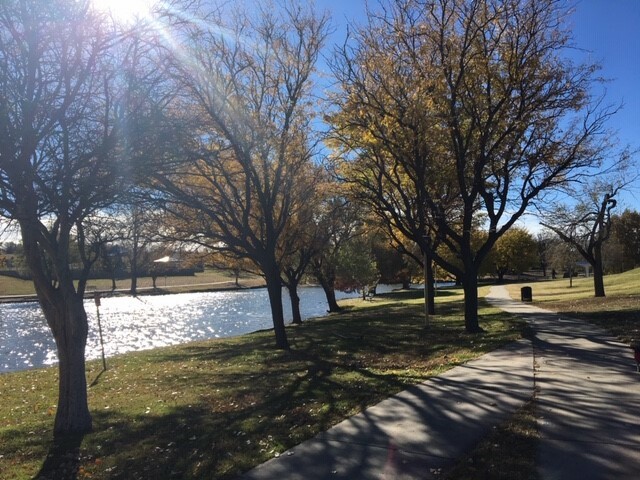 We came back to Amarillo for a weekend, took a stroll around Medi Park Lake with our precious Toby the Puppy. The sun was bright. The leaves are turning colors. And the lake is full! Indeed, the lake we saw today is as healthy — if not healthier — than any time I’ve laid eyes on it. It’s been quite a few times, given that we lived in Amarillo for 23 years. I have seen Medi Park Lake dwindle to near-puddle status. Today? It’s brimming. The Canada geese are finding their way back during their winter migration; indeed, I wonder at times which of the geese we see at this time of the year in Amarillo are returning fowl. Hey, my mind wanders on occasion. Water is rushing along culverts into the lake and then flowing beyond it, under Ninth Avenue and to points north. It does amaze me how cyclical certain matters can become. You cannot predict it will happen. It just does. Not that many years ago, Amarillo residents — along with city utilities officials — were wringing their hands as the city struggled through a punishing drought. Lake Meredith, about 50 miles north in Hutchinson County, had dropped to dangerously low levels, about 26 feet; the lake’s historic high was slightly more than 100 feet, dating back to the early 1970s. 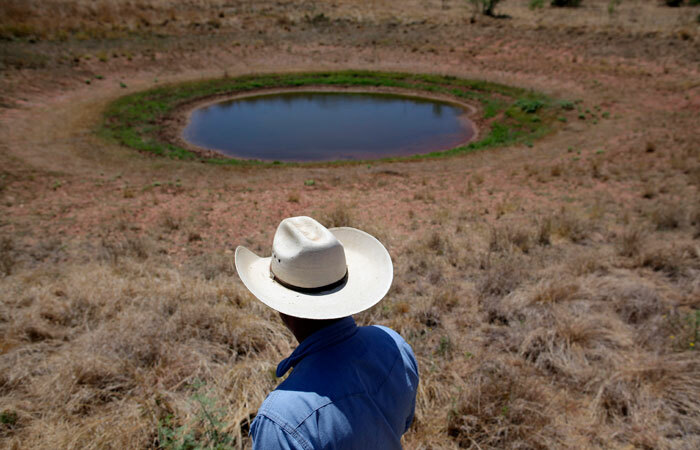 Amarillo relies on water from Lake Meredith, but then it couldn’t rely on the reservoir to quench the city’s thirst. Wells got dug. The city pumped water out of the Ogallala Aquifer. The municipal water authority stopped pumping water out of Lake Meredith because the pipes were no longer underwater! That’s changed. Lake Meredith has rebounded. Its level is something north of 72 feet. Ute Lake authorities upriver in New Mexico released water into the Canadian River, providing flow into Lake Meredith. On this day, we enjoyed a brisk autumn morning walk around Medi Park Lake. The very sight of a healthy body of water is enough to make me almost consider autumn to be my favorite time of the year. I still love springtime the best, as we come out of that dark, barren winter. In the Panhandle, it can get damn cold. You know? Who knew Lake Meredith could come this far back? I am astonished at what I am reading about Lake Meredith, the 52-year-old reservoir due north of Amarillo that has had its share of ups and downs over many years. Ute Lake, which is up the Canadian River from Lake Meredith, is overflowing. Water is pouring over the dam at Ute and is on its way into Lake Meredith. Water planners don’t yet know much water will flow into Meredith, but I’m here to tell you that it’s a big deal no matter how much water Lake Meredith receives. You see, the lake that provides water for several West Texas cities — including Amarillo and Lubbock — is in far better shape today than it was about six years ago. The lake was down to around 23 feet. It was rated as being at virtually zero capacity. Today? The lake level is approaching 70 feet, which is down from the 100-plus-foot historic high in the 1970s, but it’s still a damn sight better than it was when we were crippled by that regional drought. You can count me as a doubter who believed the lake was doomed to remain down. You also can consider me astounded that Lake Meredith is rebounding to the extent it has been able to do. The recent rain has helped, as it has fallen directly onto the Lake Meredith watershed. 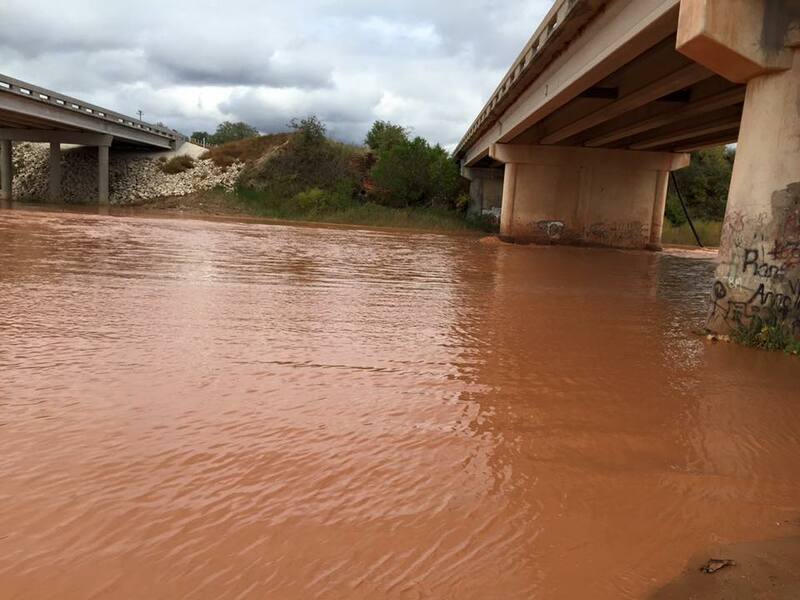 Now comes news that the deluge that soaked Ute Lake, N.M., also is bringing relief to Lake Meredith. Yes, most of the Meredith water goes toward irrigation of cropland. Some of it pumped into municipal drinking-water systems. It’s good news to be sure. I do hope, though, that High Plains residents do not grow complacent about the need to conserve this precious resource. Our water supply is going up … today. Tomorrow could tell us a different story. 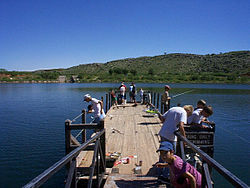 Such as been the history of Lake Meredith. Did prayer bring the water back to the Panhandle? Let’s flash back to a time just before the 2012 presidential campaign. Texas Gov. Rick Perry was thinking about seeking the Republican nomination. His state was being throttled by a killer drought. What did he do? He called for Texans to pray. The reaction by the media and many others outside of Texas was quite predictable. Perry drew criticism, even outright scorn. It was a simplistic tactic he sought to employ, critics said. Four years later, consider this: Texas is no longer in a drought. Hmmm. How could that’ve happened? Was it, um, prayer — maybe — that did it? Who can say “no” categorically? Consider the levels at Lake Meredith. The Panhandle’s largest manmade reservoir is filling back up. Last time I noticed, I saw that the lake was at 64 feet. What was it about the time Gov. Perry called for prayer? I believe it was around 26 feet. There’s more to report. Kent Satterwhite, head of the Canadian River Municipal Water Authority, says the quality of Lake Meredith water has improved while the lake levels have increased. Indeed, the levels have improved so dramatically that CRMWA has resumed pumping water to its 11 member communities, including Amarillo. Look, I’m not going to discount actual scientific factors that have contributed to the increase in moisture in this part of the world. Pacific Ocean currents are helping spur more storms. It’s that El Nino effect, right? However, neither am I going to discount a more spiritual cause for the turn of events. I’ve never been able to prove or disprove the impact of a simple act of prayer. I am left to rely on faith, which doesn’t require anyone to prove anything. Whatever the cause of the return of Lake Meredith’s priceless resource, I’m good with it. Take a good look at this picture, which I pulled down from my Facebook feed. It confirms what a fellow I met Friday told me. It’s not that I disbelieved him, but it’s nice to see visual evidence of what he said. This picture confirms some very good news for the formerly parched Texas Tundra. That water is flowing rapidly into Lake Meredith, the body of water once derided as “Puddle Meredith.” They built a dam across the river, finishing the job in 1965. The dam backed the water up behind it, forming Lake Meredith about 55 miles north of Amarillo. It rose eventually to more than 100 feet in depth. Then it receded, ever so slowly, for lots of reasons. Heavy irrigation. Growing urban consumption. Salt cedar trees planted to protect against soil erosion, but which turned out to be thirstier than anyone imagined. Evaporation and a lack of rainfall. Now the tide is turned, if you’ll pardon the metaphor. El Nino has been warming the Pacific Ocean currents. The storms have been more frequent coming in from the coast. Snow runoff in the Rocky Mountains has helped as well. El Nino, of course, is creating serious havoc as well, as our neighbors in Mexico and in downstate Texas are finding out as they’re coping with that monstrous Hurricane Patricia. We all wish them well and pray for their safety. 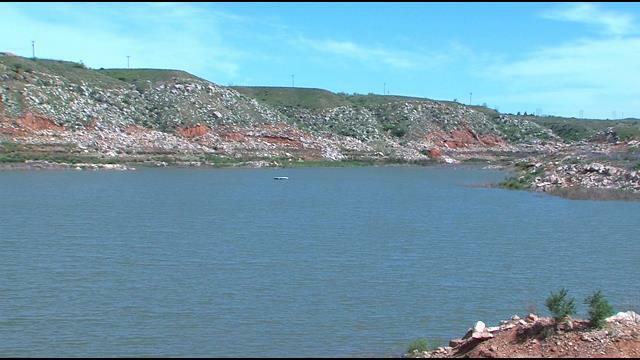 Lake Meredith, which saw its depth reduced to about 26 feet in 2013, is now back to more than 60 feet. And it’s rising. Water authorities had stopped pumping from the lake. Now they’re pumping again. OK. Is there a lesson here? Sure there is. Let’s not assume that we’ll have this water forever. I prefer to continue to act as though we’re still in drought conditions. Many of us got pretty nervous around here when the lake shrunk so badly. Remember that time? Enjoy the rain and the river flow that comes with it. However, let’s not get smug. Texas drought is over? Really? Usually, I am likely to accept the word of experts when they proclaim something about which they’ve acquired lots of knowledge. My instinct is being tested, though, just a tad by a report from the U.S. Drought Monitor’s office. It says Texas’s drought is over. Finished. Kaput. Drowned out. Hey, I know we’ve had a lot of rain. The Texas Tundra — aka the Panhandle — has been blessed beyond measure by abundant rain this spring and well into the summer. We’re barely halfway through the year and we’ve already surpassed by a significant margin the region’s annual average precipitation amount. More rain is sure to come. Late in the year, we can expect snow. But the Drought Monitor says the drought is over. Our playas are full. Our reservoirs are filling up. Lake Meredith, the region’s primary surface water source, now is well more than 50 feet deep, about double its depth from the worst of the drought in 2013. Water authorities are pumping water out of the lake and supplying it to cities, such as Amarillo. My wife and I drove to Allen — just north of Dallas — this past weekend and were blown away by the vast expanse of green we saw every mile of the way. We had to remind ourselves that this is the middle of July, in Texas, for crying out loud! Is the drought over? Well, the experts say it is. I think we’re going to keep acting, though, as if it’s still got its grip on us. Even as I write this brief post, let us ponder something that seems nonsensical. The Texas Panhandle has been drenched — and that’s a relative term — for the year to date. We’ve exceeded our annual precipitation average, and it’s only the eighth day of July. It’s raining again tonight. Hard. Should we consider the drought to be over? You’re welcome to do so, if you wish. We intend at our house to continue operating as if we’re in a drought. We won’t water the lawn, which of course is quite obvious, given that we’ve had plenty of moisture already. We intend to watch our indoor water consumption. When it dries out, we’ll keep our lawn-watering to a minimum. We only average about 20 inches of rain per year on what I call the Texas Tundra. We’ve reached that total already in 2015. Our playas are full. Lake Meredith’s levels keep rising. Who knows? Perhaps they might even release some water upriver at Ute Lake, allowing it to flow down the Canadian River into Lake Meredith. Water planners said this all could happen if we kept the faith and were careful with our water resources. Our water condition is much better than it was just two years ago. Remember, though: The drought took years to develop and it’ll take years to be abated fully. Sometimes — maybe more often than I care to admit — I’m a bit slow on the uptake when it involves certain elements of science. I’m not a scientist. Or a mathematician. Or an accountant. Numbers and scientific theories boggle me. So it is with that caveat that I suggest that I am beginning to accept the notion that pumping water out of Lake Meredith to 11 cities throughout the Panhandle actually saves surface water that collects in the lake. The Canadian River Municipal Water Authority is starting to pump water out of the lake in the wake of recent rainfall that has continued to restore the lake levels to something far greater than puddle designation. Pumping water also maximizes the quality of the water, Satterwhite said. The Canadian River contains salt that evaporates more easily during dry periods. Lake Meredith’s levels have risen fairly dramatically in recent days. It’s nearly at 50 feet, which is far greater than the 26 feet it measured in 2013. OK, so the lake is now about halfway toward its historic high of 100-plus feet set back in the early 1970s. I guess I’m trying to express some appreciation of the knowledge that water managers must have to monitor this priceless resource. The region depends on it at almost every level imaginable. There must be some faith placed in the individuals charged with ensuring we keep it as close to forever as we can. Let it flow from Lake Meredith? News that the Texas Panhandle’s leading water authority is going to resume pumping water from Lake Meredith leaves me with decidedly mixed feelings. The lake is up to 41 feet, about 15 feet higher than its lowest ebb during the late winter months. Lake Meredith now measures 2 percent full, according to state water planners, compared to the zero percent it was registering. The Canadian River Municipal Water Authority is going to blend lake water with well water underground. The idea is to relieve pressure on the Ogallala Aquifer. OK. So is it time to tap the lake? Two percent capacity still isn’t very much, correct? What’s more, the drought that has held in this chokehold for the past four to five years isn’t letting up. Amarillo remains right about at normal precipitation to date for the year. A few weeks of prolonged dryness in these parts and we’ll see counties resuming burn bans. The water planners at CRMWA are smarter than I am about these things, so I guess I should accept that they know what they’re doing by deciding to pump water from Lake Meredith. As a layperson who’s watched the lake evaporate over the nearly two decades my wife and I have lived here, it’s a bit troubling to see CRMWA acting so quickly to tap into a water supply that — as we have learned to our dismay — is a finite resource. Then again, if it relieves pressure on the aquifer, which is another finite resource, then the region’s thirst for water will remain quenched. Oh, these conflicting emotions about water. Lake Meredith returning to glory? What’s with some of this open speculation about the possibility of pumping water out of Lake Meredith, just north of Amarillo? The Canadian River Municipal Water Authority, which used to pump water from the once-full lake, says it’s risen several feet because of recent rain that’s drenched the Texas Panhandle. Why, it’s up to 36 feet, about 10 feet higher than when it hit its lowest point. Yeah, that’s a big deal. It’s not such a big deal, though, to signal a return to pumping water from the lake to cities up and down West Texas. The drought that remains — yes, we’re still in a drought around here — has reduced the quality of the water. Pumping it would require expensive treatment to make the water fully potable. Besides, let’s remember also that Lake Meredith — even in its replenished state — is still far below its historic high and is unlikely to return to that level any time soon, if ever. The recent rain has been welcome and well could signal a dramatic turn for the better in our weather pattern. Then again, it might not mean anything at all. 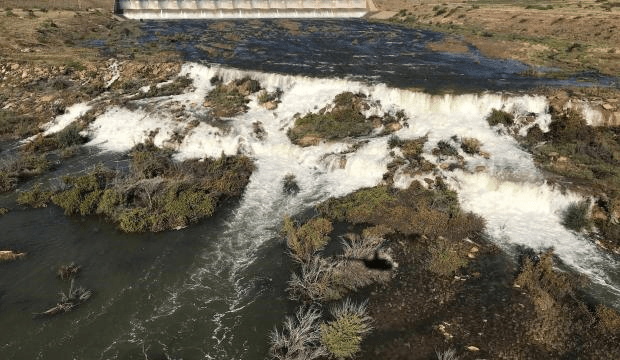 Do we pump water once again from Lake Meredith? Perish the thought.